Education is the main priority of the Ghanaian youth, but quality education in Ghana is nothing to write home about. There are myriads of problems confronting education in Ghana but several education reform efforts have been initiated over the years aimed at finding lasting solutions to problems concerning education in Ghana. In this regard Hon. Kofi Tatablata the DCE for Kpandai District in the Northern Region of Ghana paid a courtesy visit to one of the Senior High Schools in the District (Kpandai Senior High School). The DCE first met with the staff members of the school to deliberate on problems facing the Senior High School and its antidotes. The staff welcomed him for such a brilliant idea. Touching on some of the problems, the Matron of the School indicated that the school’s kitchen is in a very bad state therefore appealing to the DCE to help the school. “I tell you even the Kitchen is nearer to the school toilet which is very bad for the student’s health”. The school Dinning Hall is under trees, where students go to sit and eat. The only dining hall which was built for only 100 students now has to be occupied by over 600 students. Tables and chairs in the hall are insufficient compelling some students stand to have their meals. The building has become over the hill with cracks all over including the cemented floor, the roofs is frayed and tatty with pores and openings making sun rays and rain permeable. 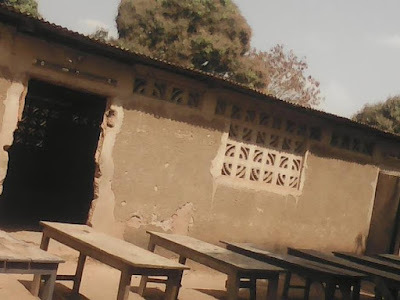 According to the Senior Housemaster of the school, Mr. Musah, even though authorities are aware of the health implications pose to students eating under bushy trees but said they have no alternative. “We can’t allow the students to continue eating in that hall, it is very dangerous. We have tried on several occasions to get authorities attention to come to our aid, at least to renovate this hall for us. We have to move them out so to protect them, the building is now dangerous”. The dining hall prefect said there has been incidence where pluck of leaves and droppings of birds and lizards would have to be removed from meals of students before they continue eating. He added that, it is very a tough task controlling the students during eating sessions.Also the distance from the Dinning Hall to the Kitchen is very far apart so it’s very difficult to always get food there for the students.She concluded by pleading on the DCE to help the school. Hon Kofi Tatablata with the staff moved on to the girl’s dormitory; the senior house master (Mr Musah) complained bitterly that due to the congestion in the girl’s dormitory, they usually find it difficult to conduct inspections. Students chop boxes are kept outside in order to pave way for them. He noted that there are some ongoing Ghana Education Trust fund (Get fund) infrastructure projects but they are moving at a “snail speed”. An 8-room GET fund girl’s dormitory started in 2010 but was only roofed about a month ago and another five room dormitory is only at foundation level,” he revealed. All these problems are retarding the pace of educational performance in Ghana today. The Senior House Master continued; many facilities in the school are grossly inadequate to mention a few, the school laboratory lack proper equipment's this is actually the “major” problems facing the school because (learning with hands on practical is the way to assimilate whatever is being taught) at the end of the day students get back home with theories they don’t even understand. Further more, the school library is below standard; it’s fully stocked with daily graphics instead of good collections of books for students to do more research for their assignments. Its quite unfortunate many of the public school (founded by Government) are those facing these problems. He actually pleaded on the DCE to help equip the school library with essential books and current journals and magazines for easy research. The Senior House Master bemoaned the lack of infrastructure development at the school; it’s one of the factors which affect the level of understanding of the students negatively. Also the classroom accommodation is grossly inadequate. As a result of the large enrollments in the school, the classrooms are usually overcrowded, with up to sixty or more students receiving instructions in classrooms designed for only thirty or, forty students. In most cases, the chairs and desks are not enough; you see them sharing chairs, standing up, or sitting on windows or broken desks! When students are overcrowded like this, there is a stalling of the teaching-learning process and a disruption of the children’s mental activity, ‘a situation that generally militates against effective teaching and intellectual development of the children. Therefore if we are serious as a district in improving this, then the government needs to invest much in Kpandai Senior High School as this is where vast majority students within the district go to. Hon Kofi Tatablata in his response promise to put their pressing needs first, he charged the management of the school to at least provide the necessary documents to the abundant buildings in order to do a follow up. He also asked the staff to work together as a team in order to attain their ultimate goal. Hon Kofi Tatablata indicated that the government is ever ready to help develop Kpandai Senior High School.